OrthoIndy Hospital is the first facility in Indiana to add the Mazor X™ Robotic Guidance System to its hospital. The Mazor X Robotic Guidance System combines pre-operative planning tools and analytics with intra-operative guidance, giving OrthoIndy spine surgeons advanced spinal surgery options. The first procedure in Indiana with the Mazor X was performed at OrthoIndy Hospital on March 29, 2018. OrthoIndy Hospital has established its reputation as a leader in spine surgery with its advanced technologies and excellence in patient care. The Mazor X Robotic Guidance System helps us to continue our leadership in spine surgery excellence. OrthoIndy Spine consists of seven fellowship-trained surgeons, including: Drs. Michael Coscia, John Dietz, Robert Huler, Gabriel Jackson, Kevin O’Neill, Greg Poulter and David Schwartz. Learn more about OrthoIndy’s spine robotics program. The OrthoIndy Marketing team is committed to providing our community with the latest in orthopedic news. For all media inquiries, please contact us at 317.802.2085 or send us an email. 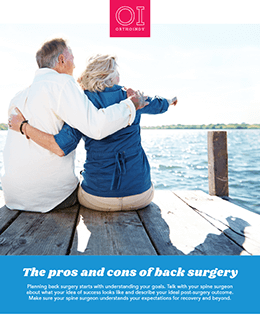 Do you really need back surgery? Learn when it’s the right choice and what are your alternative options.